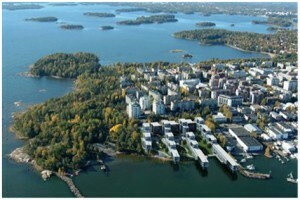 The Finnish case study in Helsinki will demonstrate neighbourhood energy management in the low energy housing area Merenkulkijanranta, Finland. The housing area “Merenkulkijanranta” in Lauttasaari Helsinki will consist of new high-quality blocks of flats (illustrative figures below). The area will have a total of 240 apartments in seven different housing companies offering housing for thousand inhabitants. The construction started at 2008 and will be ready about 2015. At the moment 3 out of 7 housing companies are ready and 2 are under construction. The area is designed as advanced area, where new technologies, like seawater cooling, are used. All apartments are connected through Caverion’s building automation system to 24/7 service. The total energy spent on heating is 120kWh/m2, of which 70% is used for heating of spaces and 30% for domestic hot water. District heating provides the total heating need. The heat is distributed centrally into apartments. According to thermal simulation the indoor temperature in apartments from May to August will raise over 50 centigrade without both passive and active cooling solution. The estimated active cooling need is 2kW / apartment. This cooling is provided fully by sea water cooling system. In EEPOS we demonstrate the existing sea water system use for heat generation outside of cooling season. Heating, cooling, ventilation power and other systems are controlled though advanced building automation system that has a web based interface. End users can as well easily make effect on energy consumption, like by selecting the ventilation mode between absence, normal, or boost. The magnitude of ready apartment area is 10000 m2. 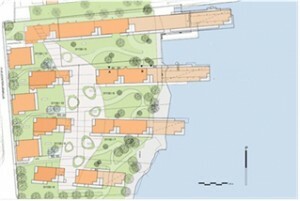 The total area will be around 24000 m2.